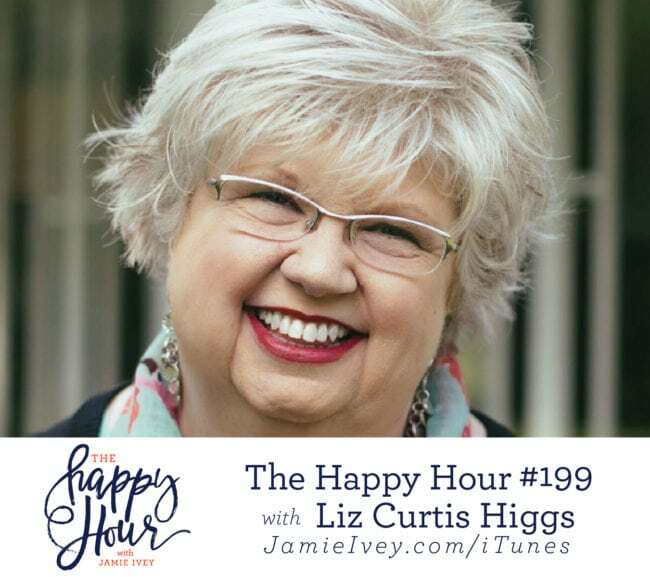 My guest for The Happy Hour # 199 is Liz Curtis Higgs. Liz is an author, speaker, and has three abiding passions: encouraging her sisters in Christ, exploring the stories of women in the Bible, and writing novels set in Scotland of old. Liz has written 37 books and travels around the world speaking and encouraging women. Liz is mom to Matthew and Lillian (recent college grads!) and when she's not traveling she loves being home with her husband Bill and her twin tabby cats Boaz and Samson. Friends, I am so excited to share today's episode with you and I know you are going to love hearing from Liz about her story, how she came to write about the "Bad Girls" in the Bible, and her current fight with cancer. No matter what the circumstance, Liz brings hope and encouragement for us all. Liz starts off the show sharing how she came to know Jesus and how He saved her from a life she knew was leading her towards a dead end. She tells us how a couple who had newly come to know Jesus "loved her into the Kingdom" by simply sharing what they had so recently learned. I love that so much because it affirms that we can't know it all, but that doesn't mean God can't use us in ways that impact others. We also talk about shame and how it can stop us from telling our stories or truly experiencing freedom. Liz tells us how she never intended to write "Bad Girls of the Bible" and how God led her down a path that opened more doors than she ever could have imagined. In the last half of the episode, Liz talks about her current fight with cancer - her "annoyance" she calls it. She candidly talks about what it's like to face less than promising news and how even amidst this suffering she sees God's faithfulness each day. She says "no matter what tomorrow brings, God will not be shaken." Patioshield by Thermacell use code happyhour and save 20%! 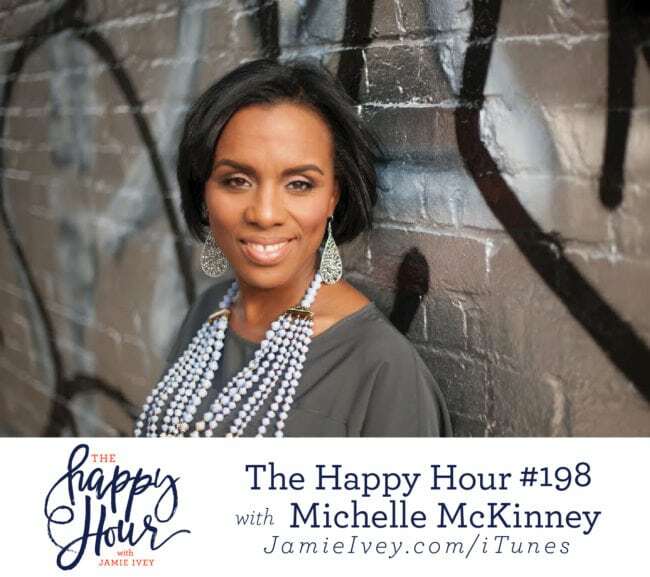 Beyond Burger - click "where to find"
My guest for The Happy Hour # 198 is Michelle McKinney. Michelle defines herself as a Dream Architect and she brings her 20-years experience working alongside senior executives at companies such as Starbucks, American Express, Fannie Mae and Zion, to help women design, construct and bring their God-given dreams to life. Michelle and her husband, Tony, reside in Maryland with their 4 children - Caleb, Mekhi, Anthony and Selah. I knew Michelle and I would get along when I saw her dance onto the stage at Shine, and she brings her joy and energy to the show today - I know you're going to love it. Michelle believes that every woman can fulfill her God-given purpose, and on today's show we talk about how women can discover those dreams and move through the restlessness, yearning, and transition of when God is transplanting us to something new. We discuss the struggle of finding contentment in a season instead of only focusing on what's next. I love her idea of keeping a journal to write down your wins each day - it's such a great way to celebrate and look back and see how God has been working in your life. In the second half of the show we discuss one of my favorite topics - marriage. Michelle speaks about marrying for love and purpose. She says, "marriage is about partnership and being able to build something to advance God’s kingdom even more than what you could do alone." Lastly, Michelle tells us about what is now my new favorite idea for a party - a bridal shower reboot for her 20th wedding anniversary! Join us for Books & Brews with the Iveys! Get your tickets HERE. 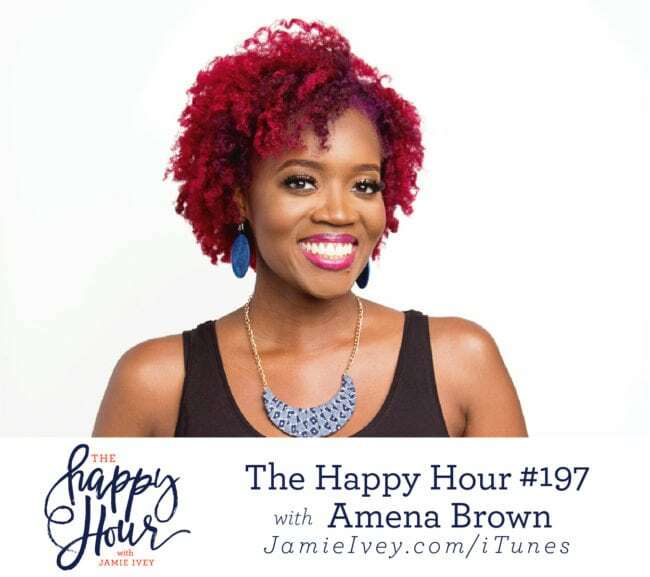 My guest for The Happy Hour # 197 is Amena Brown. Amena is a poet, speaker, author, and event host. Named one of Rejuvenate Magazine’s Top 40 under 40 Changemakers, Amena is the author of five spoken word CDs and two non-fiction books. She has performed and spoken at events across the nation, and she and her husband, DJ Opdiggy, live in Atlanta. On the show today, Amena and I talk about everything from grief, infertility, ministry, and the creative process she goes through to bring a poem to life on stage. One thing's for sure - I could never do her job! Amena and I dive right in and start talking about the feelings of living a life you didn't think you'd live. Amena shares how she learned to grieve the loss of expectations, and how she realized, "to experience joy most fully, I had to also experience the grief." We also talk about the importance of finding those people who will walk beside you and be truly present with you amidst different seasons of life. In the second half of the show Amena describes her creative process as a poet and you guys, it's incredible. We talk about performance as a craft and ministry, and she tells us how we can find spoken word in our own communities. Amena then discusses her involvement in international ministry. Amena reminds us how important it is to really know the organizations you're going with, what they represent, and most importantly who and how they're partnering and led by those in that country. SAS Footwear - code: happyhour for free shipping or mention Happy Hour in-store for $10 off. Follow SAS Footwear on Instagram! 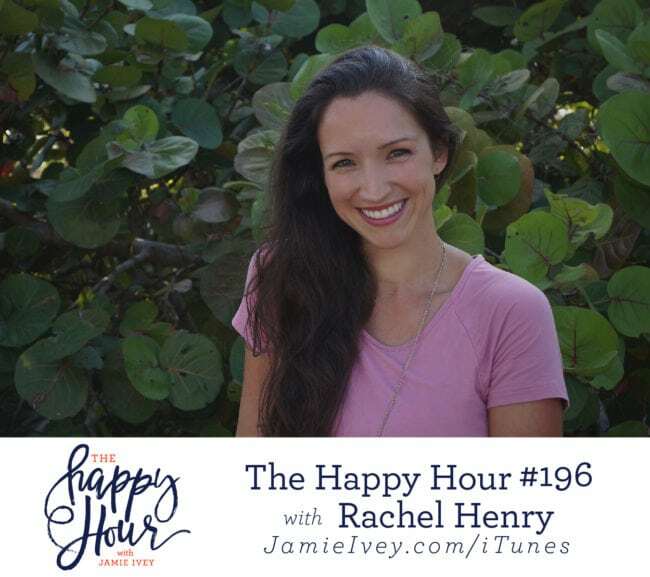 My guest for The Happy Hour # 196 is Rachel Henry. Rachel is wife to her high school sweetheart, Simon, and they have six beautiful children whom she's home-schooled for the last two years. Rachel and her family reside in Florida where they like to live like they're on vacation every day! Friends, I'm going to get straight to it - today's show is difficult to listen to. It's difficult, but incredibly powerful and full of hope and healing amidst tragedy. A few warnings: in the episode today Rachel talks about the night that her home was broken into and she was raped. I encourage younger ears to have an adult listen first. Also, if you struggle with fear around these topics, have a trusted friend listen first and guide you on if you should listen and/or any parts you should skip. What Rachel has experienced is absolutely horrific. As you listen to her share her story, you will also hear loud and clear the hope she carries, and how God has been with her and her family through their journey. I was floored listening to her describe the trial and how she faced her attackers and told them she forgave them, and how she's prayed for them. In the last part of the show, Rachel talks about her journey of healing and how crucial it was to find the right therapy. Rachel describes the effectiveness of EMDR (Eye Movement Desensitization and Reprocessing) with traumatic experiences and how it could help others. I am incredibly grateful to Rachel for her vulnerability and sharing her story so that others would be encouraged and have hope. What Rachel is loving: Fabletics leggings, corkscrew hair spirals, naps! It's not too late -- Join the Happy Hour summer book club! Don't miss the next Happy Hour Live October 5 + 6! Get your tickets here.